We’d love your help. Let us know what’s wrong with this preview of Zulu Heart by Steven Barnes. Zulu Heart returns to the 19th Century of Steven Barnes's justly acclaimed novel Lion's Blood, a brilliant alternate history in which black Africans have colonized the New World with white Europeans as their slaves. To ask other readers questions about Zulu Heart, please sign up. We return to an alternative history of North America and the lives of Kai ibn Rashid and Aidan O'Dere. It is four years on from the events of Lion's Blood and the dominant world powers, Abyssinia and Egypt are on the brink of war. Their colonies in the New World are about to be drawn into the conflict. Kai, a member of the privileged ruling class and this friend, Aidan, the freed ex-slave, must work together to establish a future for themselves and their people. Zulu Heart is a well written nove We return to an alternative history of North America and the lives of Kai ibn Rashid and Aidan O'Dere. It is four years on from the events of Lion's Blood and the dominant world powers, Abyssinia and Egypt are on the brink of war. Their colonies in the New World are about to be drawn into the conflict. This is the sequel to LION'S BLOOD, and also an amazing book! This is just a fine book. It is the sequel, of course, to Lion's Blood, but I have to hand it to Mr. Barnes in that the story and the characters have advanced. We still have Kai and Aiden, brothers beneath the skin in a nation on the North American continent where things are delightfully awry compared to today--somehow in the distant past it was the African nations, and not the Europeans, who conquered the world with learning and art and culture and military prowess. Kai is now functioning as the This is just a fine book. It is the sequel, of course, to Lion's Blood, but I have to hand it to Mr. Barnes in that the story and the characters have advanced. Kai is now functioning as the Wakil of his estate-empire, a slaveowner of northern Europeans, and now-freed slave Aiden is living with his wife Sophia, when challenged occur that drive them both in directions they neither expect nor want. Nandi and Laminya are back in the picture as well, and there is betrayal and love and death and the ecstasy of triumph. Familiar faces of wisdom return in Babatunde, and there is the tension of truth as a tension between faith and life. Aiden will set out on a journey to find his long-lost sister, separated at the moment of enslavement, and Kai must walk an extremely fine line to manage the competing powers of Africa that would seek to divide and conquer the nations of America even further. There are shifts of political power that could result in disaster with a single wrong move, and there are assassins ready to strike a dagger into those he loves and protects. Swordplay and fights and love and betrayal swirl throughout the book. It is a wonderful sequel, and thankfully not just an extension of the previous story--that is, it isn't just Part B. It is an expansion of the people and the depths of their existence. I loved Kai in the first book, and now I find that I would like to meet him some day in a world where all the good things of life that I know and imagine come together. I found the first book in this series, Lion's Blood, to be well-written but too heartbreaking to want to re-read. Zulu Heart, on the other hand, I loved unconditionally. I loved the solidity of Kai and Aidan's friendship, the way that over the course of the two books they grew both individually and together. I loved the nuance of understanding throughout, such as Kai's acknowledgment of the economic practicalities of slavery. I like the balance of exposition and mystery. I like how martial prowes I found the first book in this series, Lion's Blood, to be well-written but too heartbreaking to want to re-read. Zulu Heart, on the other hand, I loved unconditionally. The second book in the In'shalla series. We follow the freed slave Aiden as he tries to build a settlement of freed slaves, and his former Mastr Kai who is now lord of his lands, and being pulled by different powers as Ethopia and Egypt extend their wars into the colonies. Another look at what the world in the 1800's would look like if the Romans had not been able to build their empire and lands in Africa were the colonizers of the world instead of the Europeans. This book left of everything Kai and Aiden faced for both of their futures. I feel that both books were beautiful written. And despite race and class both Kai and Aiden shared a loving friendship and bond that could not be broken. I loved the wisdom of Babatunde. I would have like to find out what happened to Kai's sister. I would strongly recommend reading both books. I wish there was a third book. The first book in the series was so excellent, I just had to read the sequel. This book could probably be read as a stand-alone, but why not read the series from the start? It is richer and far more interesting. The character development was astounding. And the storyline was surprising and engaging. Really, really excellent read. I cannot possibly recommend this series more. It is exceptional and eye-opening. The second book in the series picks up right where the first left off and simply flies from beginning to end. Truly outstanding material. The only problem is that there aren’t MORE books!! while i liked this book with the same fascination as "lion's blood," in that barns continues his exploration of african colonial superiority in the new american colonies, the characters have aged and their interests include romance. this, i don't find as interesting. although this does allow for some female characters, now teenagers and older, to take more significant roles as heroines in this sequel that is less male centered. Have to read previous book, there are things I needed to understnd however it did't disrupt the flow of the story for me. I love Steven Barnes writing and in process of collecting as many of his books as I can get my hands on. His writings touch all of the "isms" in life in various ways yet not over done. On it's own, this is a really, really good book. However, it follows Lion's Blood, which is a truly exceptional book, and it simply does not stand up to that level. I expected more, and while I was not disappointed per se, I feel that this novel lacks the emotional punch, the heart, that made Lion's Blood such a great book. A good follow up to Lion's Blood. The characters grow and develop in interesting ways. Steven Barnes shows one of his strengths well in this book, namely, his ability to write great hand to hand combat scenes. A story set in an alternate America where Africa colonized the new world. As alternative history this book was amazing. I do hope Barnes will eventually continue the series. An exciting sequel to Lion's Blood. 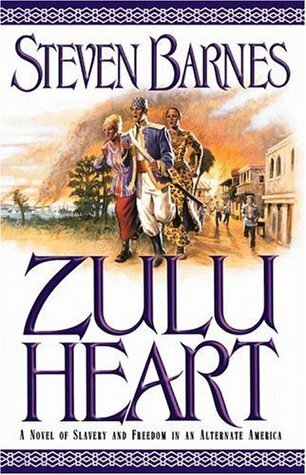 Zulu heart was amazing, reverse rolls in slavery, and a warioirs journey. great read. it took me a few days to get into it, but once i got into it i couldnt stop. Amazing! Great follow-up to Lion's Blood!! A must read!